Dermatologist tested Dove® Clinical Protection delivers prescription strength defense against wetness and contains Dove® ¼ moisturizers to care for delicate underarm skin. And unlike leading prescription anti-perspirant/deodorants, it does not contain aluminum chloride or alcohols which can cause skin irritation and discomfort. With our most powerful all-day protection and exceptional skin care benefits, it is the ultimate combination of strength and beauty. I always loved Dove deodorant and wondered would this keep me feeling the same. Although it has some anti perspirant properties it's not as good as Rexona. I find I have to reapply to keep my perspiration at bay. That's not what I'm looking for. I also have the problem with transfer onto my clothes and leaving white marks or balls without realising what it was until having left home(not cool). Although the scent is pleasing the performance isn't what I'm after. I only purchase this when Rexona is not available. Tips: If you have thick thighs this good to rub in between for days when you wear skirts and dresses as anti chaffing or clinging. Unfortunately this product really was not for me. I found this deodorant too thick and pore clogging, creating hard lumps on my arm pits - not cool! Also i found the packaging/application for this deodorant really messy! It leaked over the sides of the deodorant, sticking to my hands and leaving marks on my cabinet. Also this deodorant is NOT anti - white marks! This stuff stuck like glue to all my black clothing and left horrible stains! Going straight back to Rexona after this! While looking for my fave deodorant at the supermarket (Rexona clinical protection) I couldn't find it, I had 2 grumpy and tired children with me so grabbed this one, I was disappointed and I couldn't bring myself to use it because I wanted my beloved Rexona! I have this in the cucumber and green tea scent, I love this scent it is so clean and refreshing, I also love the soap in this range it's very refreshing and just reminds me of summer. The packaging of this is the same as the Rexona clinical, with a twist up dial on the bottom and the white paste comes out of some holes at the top. The label on the front states 48hour protection, sounds good to me! I do find this easy to apply and I find it dries a lot quicker than the Rexona. I really love this deodorant because it doesn't irritate my pits if I shave or wax more than I really should and they don't feel all dry and itchy. I am not generally a big sweater but since it has been crazy times at work in the warm weather I have been getting a bit sweaty and this has had me covered my armpits and dry until I shower at night..PERFECT. Would I buy again? Yes this is now my favourite (sorry Rexona) it is on the dearer side but it is worth every cent knowing that I'm covered and it's non irritating. I love Dove, smells great, feels great and this product is no exception. I previously was using the Rexona Clinical Protection but this one was cheaper so decided to give it a go. Its pretty much the same product but with a different scent. It leaves me feeling clean, fresh and smelling great and no issues in the day with sweating or wet patches. I really need to give this a go when the really hot weather comes then comes the real test. This product was an absolute lifesaver as a sweaty adolescence!! Putting it on is like putting on a barrier. Cool clicky container as well. Could not live without!! The BEST deodorant for summer! 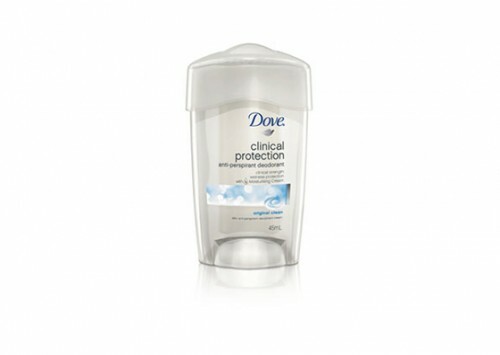 Dove Clinical Protection is hands down, the best deodorant I have ever used. I have been using it for the past two months and no longer fear the dreaded sweat patches on my cotton tops! The deodorant is packaged in a slim, oval roll up device. When you twist the dial at the bottom, the product comes out the top in small white blobs- I really like this because you have a visual of how much product you are actually using. It has a gentle, powdery smell but does not feel powdery on the skin. The deodorant dries quickly, leaving no trace but be careful to let it dry before dressing, otherwise it can leave white patches- luckily I am only talking a minute or two to dry! I can confidently say that this deodorant keeps you feeling dry and smelling fresh for the entire day- something I have never been able to say with any other product. I believe that at $14.99, it is priced well as it lasts roughly two and half to three months, with once daily application. A long came Dove clinical protection and My life has changed. Wearing white is no longer a problem, dancing all night long, working out and hot days are no longer my armpits enemies. This drys up your skin, you can feel that when you have a shower and wash under your arms but it doesn't matter because their still smooth and you never have the dreadful BO or sweat like your laying in a sauna for a day. I will never go back to any roll on, spray on , rub on deodorant. Dove clinical is now a way of life. Tips: Apply before bed and in the morning. Well i tried this instead of buying the Rexona brand one day cos it was on special and i thought it might do the same thing as the rexona one. But I wasn't much impressed as much as the rexona brand. This was easy to apply and the scent was a pleasant one, i applied the same as i would have done with the rexona brand and did it every day but did notice my underarms weren't always dry and i did sweat a little, while using this product witch was a shame. As like the rexona brand it does also leave a mark on your top so just remember to wear a top that does not touch your underarm. the price is the same as rexona but i am sticking to the rexona brand as i feel it worked better on me. I was really excited when the clinical strength antiperspirants started coming out as regular antiperspirant has never worked well for me, I always sweated through it by the end of the day and I hate that feeling! This product definitely keeps me dry all day. Sometimes thats really all you need, job interviews, special occasions etc would definitely benefit from a surefire dry result. I have however found that it can irritate my skin and leave me with itchy underarms. Unlike other products it doesn't wear off by the end of the day meaning it's still there when you sleep, and when you get in the shower the next morning. I try to wash it off with soap and it doesn't really budge. Meaning I don't feel comfortable using this everyday because I don't want to load up my skin with layers of product. Overall this product definitely keeps me dry, which is the intention so I will continue to use it when that's really important to me i.e important occasions, very hot days etc but I may use another, weaker antiperspirant as an alternative also to give my skin a break. Tips: Only apply a thin layer, you really don't need anymore. Also, do a skin test before using it regularly in case it irritates your skin. I am a big fan of the clinical protection deodorant's. I thought the Dove one has a lovely fresh scent and it is perfect to apply straight after a shower before bed. Last's all night and the next day. Great if you play sport or heading to the gym - really reduces the amount of sweat and body odour! I would say it is at least twice as effective as a regular deodorant so even though it costs a bit more it is worth it. The cream absorbs into skin and doesn't leave residue or feel sticky either.